Marinas, Yacht & Boat Berths – Has Failte Ireland Been Lost at Sea In Recent Years? #marinetourism – Yet another Failte Ireland Marine Research initiative is taking shape to examine the coastal infrastructure for leisure sailors of all kinds, and how facilities might be developed to attract visitors from abroad, while better serving the home fleets. In view of this new research programme, W M Nixon returns to the topic of Dunmore East's potential for development, and sets it in the national context. Every port in Ireland should be so lucky as to have someone like Harry McLoughlin as Harbour Master. Down in Dunmore East, he's passionate about fulfilling the potential of his picturesque harbour. And it's no easy task, as Dunmore is trying to cope with meeting the demands of a growing home port fishing fleet, while the numbers seeking berths can fluctuate rapidly with visiting boats. At the same time, the peak summer months will see leisure craft arrive in unpredictable numbers, keen to avail of any sheltered berthing to be had in a port whose strategic usefulness will be obvious to anyone with experience of cruising the Irish coast. And on top of that, from time to time cruise liners will call by, anchoring off and seeking to disembark passengers via their ship's tenders in this characterful little port, where virtually every inch of quayside and pontoon space is already taken by a wide variety of boats. This provides a colourful and crowded scene, which makes it even more attractive for visitors who might be jaded by the usual big port/cruise liner berthing routine. But it's a headache for a harbour master who has to juggle the often conflicting requirements of different boat interests. Last week's series of photos gave a snapshot of a few moments in a Dunmore East summer afternoon which well illustrate the challenges that Harry McLoughlin constantly faces. The reality is that the new industrial-style 40 metre pontoon along the East Pier under the lighthouse is a multi-purpose facility. Certainly it has been installed with leisure visitors in mind. But thanks to the welcome growth in the Dunmore East fishing fleet in the last couple of years, there are times when the dedicated pontoons for smaller fishing craft in the southwest corner of the harbour become impossibly crowded. The main quays have to be left clear for large trawlers unloading their catches and their other berthing requirements. So when there's so much pressure on space, some smaller fishing boats are sent across to the Visitors' Pontoon if it happens to be clear, and no visitor is expected. It has to be confessed, though, that some of us when cruising are oddly reluctant to call ahead to the Harbour Office when approaching a new port. We prefer just to come in round the pierhead, hoping to be able to choose our own favoured berth without any communication with officialdom at all. It's part of the attraction of cruising when you can do this, as it adds to the sense of freedom which commanding your own small boat is supposed to confer. But the reality is that in a place like Dunmore East, you just have to call ahead, and that is what last week's photos, in the final analysis, seem to be all about. But with so much pressure on space, how can Dunmore also cope with the special demands of cruise liner passengers – many of them far from the first flush of youth – disembarking from ship's tenders? Well, in the spirit of community which keeps Dunmore going, the secret is the cruise liner passengers are allowed to come ashore on the usually hallowed territory of the RNLI pontoon. That such a temporary re-allocation of resources is necessary from time to time reinforces the genuine demand for improved facilities at many of Ireland's key ports. It will be interesting to see how the priorities are high-lighted by the international research programme which is being implemented under a new Failte Ireland initiative, with an advisory panel of Norman Kean, who researches and edits the Irish Cruising Club Sailing Directions for both the book and on-line versions, Paal Janson the General Manager of Dun Laoghaire Marina, representing the Irish Marine Federation, and Gail MacAllister of the ISA. We could be forgiven for being a bit bewildered about some of this. Exactly seventeen months ago, in this blog on Saturday April 13th 2013, we were welcoming an up-coming report for Failte Ireland, titled: A Review of Tourism Policy Regarding the Funding of Marina and Berthing Facilities in Ireland. Ultimately known as the Fisher Report and resulting from the work of an agency from outside Ireland, it has since been gathering dust on some shelf. Now, that dust has apparently congealed into aspic with the realisation that the report was so vague and general that it didn't provide any sufficiently clearcut conclusions and proposals to form the basis of a policy. The questionnaires which are being developed will be targeted at Irish, British, French and German markets. Making a point of ensuring that Irish leisure sailors are included in the equation strikes me as essential, for not only are we often sailing visitors in our own country, as our island's coastlines are long enough and sufficiently varied to make this the case, but visitors from abroad are attracted by the vibrant Irish sailing scene. Thus anything which provides better facilities for our own sailors will be beneficial in a much wider context. The guidance of someone as experienced in cruising as Norman Kean will be invaluable, as the framing of the questions is vital in producing a worthwhile result. Then too, Norman is at the heart of the Irish sailing and boating scene, both with his key role in the internationally-praised Cruising Club Sailing Directions, and the fact that he is based at Courtmacsherry in West Cork, a friendly port which has shown it knows a thing or two about how to make visiting cruising boats feel welcome, and wish to come back again. So we can be sure that the doughty Norman will accurately and eloquently represent the views and requirements of the Irish boating community, whose enthusiastic approach to sailing in all its forms is an important part of the package for boating visitors. This is all-too-frequently overlooked by the powers-that-be, who are so keen to tot up numbers of new visitors that they overlook the existence and needs of Ireland's large home sailing community, all of whom are more than willing to be personal hospitality managers when visiting boats come to call. It seems that with the Fisher Report, we didn't even get a slow horse, we got a lame duck. So for the moment, instead of setting up a ponderous set of questions, Afloat.ie will simply dream on. What do we want for good cruising in Ireland? Well, setting aside those who insist that a giant astrodome should be installed to cover the entire country before they'll come near the place, we have a wish list that begins with good sailing which is sometimes sufficiently challenging to make the completion of each passage a satisfying experience. And all of it to be done with a background of attractive coastal scenery. As for making safe passages, and then getting the best from each haven at the end, we'll know that the Irish Cruising Club Sailing Directions are an indispensable guide. Ideally, we'll be in an area with an abundance of natural anchorages where we can put down our own anchor without fear of fouling abandoned moorings or other detritus on the seabed. If there are reliable and regularly-serviced visitors moorings, that's fine and welcome too. But we who cruise the Irish coast, and the western seaboard in particular, do so in the knowledge that any proper cruising vessel will have her own more-than-adequate ground tackle. If we happen to be sailing along an Irish coastline which lacks an abundance of natural harbours, we would like handy artificial harbours – preferably with marinas – at about 35 mile intervals or even less, as 35 nautical miles seems to be the magic distance which is easily attainable in one day, yet its completion really does make you feel you've moved on. This sense of needing to move on is part of what cruising is all about. It satisfies some hidden genetic urge which most of the time is dormant in us, but given half a chance, there is indeed a gypsy in our soul. However, having satisfied our wanderlust by the modest total of 35 or so miles made good, what will we expect to find ashore? Your complete dyed-in-the-wool cruising person is often content simply to stay on board enjoying the natural grace which is provided by a boat lying comfortably to her own anchor. Be sure, though, to choose a spot where your pride-and-joy won't be uncomfortably tide-rode, which so often turns out to be the case in what looked to be a snug if narrow inlet. In their wellnigh perfect anchorage, these traditional cruising folk will be happy to dine aboard. At such times, you realise that a good sea cook is a pearl beyond price, much more valuable – in this age of sensitive auto-helms – than a top helmsman for the general welfare of the crew and the success of the cruise. Such traditional cruising people, if they do go ashore, are quite happy to scramble up some awkward foreshore for a bracing hike on nearby moorland, or even climb a mountain or two. But the vast majority of us – and an increasing majority as newcomers arrive in cruising – prefer to get easily ashore from an anchored boat via the dinghy onto a good jetty, and ideally a landing pontoon - such as you see at civilised places like Mayo Sailing Club on Clew Bay – is both much safer, and more convenient. However, let's face it, when cruising you're on your holidays. After a perhaps slightly rugged day at sea, there's no doubting the benefits conferred by a comfortable marina berth. Apart from the safety and security, there's the simple sense of freedom. While there are those who enjoy the restricted and aromatic confines of a cruising yacht, for many it can quickly become claustrophobic, and the freedom of personal movement which a marina confers on the cruising crew can be vital for preserving harmony. And it greatly broadening the options of what to do once ashore, because unlike the crew from an anchored boat reliant on one dinghy, crews in marinas can come and go as they please. 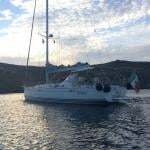 Perhaps it's the fact that they have this choice is one of the reasons why, by and large, cruising crews tend to stay as a group when they are ashore – they may even be celebrating the fact that they're still friends, and a marina can help in this. As to what's needed ashore, basically it's good hospitality facilities within easy walking distance. The "easy walking" requirement cannot be over-emphasised. Once you're into a cruise, you're moving at a different speed in a different frame of mind, and too much walking on tarmac or cobblestones or whatever becomes simply tiresome. In fact, you'll have noticed that some experienced cruising folk are surprisingly willing to take a taxi if there's anything other than a short walk involved. For they also know that, coming off a boat, you're out of sync with road traffic – a cruising crew ambling along a busy road can be a hazard to themselves and a distracting menace for other road users. So we're beginning to get the picture of our cruising crew's Irish dream port. It has to be colourful, characterful, and compact. Ideally, all facilities for every possible need, including repair, fuelling and re-storing, should be within easy reach from a marina berth with full-sized walkways and proper pontoons – you might be a bit rocky on your pins after a rough day at sea, and sea legs need something better than a cogglesome thin little finger pontoon. From all this, it is clear that Kinsale is the Irish cruising port par excellence, even if the Yacht Club marina does get over-crowded betimes, and even if, when the ebb is running hard and there's a strong sou'easter blowing, the boats rafted along the outer berths have a bumpy time of it. Despite all this, Kinsale has so much to offer we can learn from it, and from other top cruising visitor places like Dingle and Howth while the new harbour at Greystones on the Wicklow coast is a fascinating example of a port in active transition from a small boat mini-haven to a proper harbour with marina and full facilities for multiple uses. But equally there has to be fresh thinking about making the best of existing ports. In other words, the old notion that some ports should be exclusively designated as Fisheries Harbours is patently nonsense when those harbours are located in key positions with ready-made characterful port towns and villages as part of the package. There still is some residual resistance in a few ports to the very notion of a marina being installed. But it should be seen in the broader context as an indicator of attractive peace and prosperity, every bit as much as a facility for visiting boaters who will be keen to spend their holiday money ashore. I was recently in Ballycastle in the far northeast corner of Ireland, and in going up the town we noticed a welcome air of prosperity. Buildings had been painted and generally spruced up. This was even more marked in the area down beside the little harbour, where there's a small but very useful marina, and the regular ferry leaves from its much-improved berth for Rathlin Island six miles away. We still think of it as the "new harbour and marina" at Ballycastle, although it has been around for some time now. But such facilities are put in for the long haul, and it is now that Ballycastle harbour's attractive sense of purpose and prosperity has had this beneficial spinoff for the mood of the town. Elsewhere in the north, one of our favourite ports is Ardglass, where one of the most strategically useful marinas on the entire Irish coast was slotted into a spare corner of what had formerly been a decidedly rugged "fishing-and-fishing-only" place, and the mood has been pleasantly lightened as a result. But for pure rugged essence of total fishing port, you just couldn't beat the Wild West atmosphere of Killybegs in Donegal. The fishing has been mighty, and there are now at least 23 multi-millionaires in the Killybegs area whose wealth has been drawn from the sea. Yet in recent years, the Killybegs attitude has softened slightly. The place has tidied itself up, and as one of the best natural harbor in the entire northwest of Ireland, it has put out some visitors' mooring for leisure craft, while serious cruising men visiting this challenging but rewarding area find that the Mooney Boats quayside yard with its massive travel hoist is a real boon. So if Killybegs can take aboard the idea of a marina, maybe the other mega-fishing-port of Castetownbere in southwest Ireland can do so too. That said, there is a hugely popular little marina already well established at the other end of Bere Island at Lawrence Cove, but a convenient facility at the western end of Bere Haven would improve cruising options. In the cruising heartlands of West Cork, we can expect new movement on the long-proposed marina at Schull, which would greatly help in rationalizing pier use. But in bustling Baltimore there may be more of a challenge in creating a proper marina, as waterfront space beside the village is limited. As it is, the current berthing pontoon which juts straight out into the harbour can be a mixed blessing when there's a serious wind from the west, with the pitching and banging of boats and pontoon sections being a nuisance at best, and a real hazard at its worst. The berthing pontoon at Baltimore can become a decidedly exposed place when the wind is fresh from the west. But all these places already have something of a range of choices, in Dunmore East there's just this one little bit of a harbour, and everyone wants a piece of it. I make no excuses for dragging out the dog-eared rough sketch of what a marina might look like if there was to be a realistic separation of fishing and leisure use, for while we do suggest that places which were originally exclusively fishing ports can be usefully modified to be partially leisure ports as well, there's no doubting the primary need of clearly defined boundaries between the two within the harbour confines. For there's no doubt we all wish the very best for Dunmore East. It very much wants to be a hospitable port, and can do it very well too, given half a chance. Harry McLoughlin was talking enthusiastically about some of the fine boats and great sailing people he has welcomed since he took over as Dunmore's Harbour Master in the Spring of 2013, and from 2014 he best remembers the great Jim Mottram. Jim cruises alone in his pretty little Elizabethan 23 Reservation out of Christchurch in Dorset just outside the west entrance to the Solent, and over the decades he has logged some formidable voyages, down to Spain, and round Britain three times. 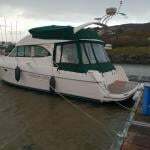 But as his boat has a lifting keel which reduces the draft to 2ft 6ins, for 2014 he decided that a cruise to Ireland with a spell on the inland waterways would make for a change. The most senior sailor – Dunmore East visitor Jim Mottram has cruised thousands of miles in his Elizabethan 23 Reservation. So he arrived into Dunmore East early in the season, intending to go up the Barrow, across Ireland on the Grand Canal, then back to the sea again via the Shannon through Limerick. But after going up to Waterford from Dunmore, he reckoned the early-season surge down the River Barrow would make things unnecessarily difficult, so he cruised right round the south coast of Ireland and went up the Shannon Estuary to Limerick. There, he unstepped his mast, and motored north through Lough Derg and into the Grand Canal at Shannon Harbour, then right across Ireland to swoosh down the Barrow – which becomes even more lovely the further south you go – until in New Ross the manager of the Three Sisters Marina John Diamond set him up again, and on he went down to Dunmore East for a warm welcome and a celebration of his near-circuit of Munster. Harry McLoughlin discovered Jim had a special birthday coming up while he was in Dunmore East, so he and his wife took the lone skipper along to the Waterford Harbour Sailing Club for a party to celebrate both the birthday and the success of his cruising since he'd last been with them. And which birthday was Jim Mottram celebrating?